Does This Figure Show Why Fed Policy Failed? What do you see in this figure from a recent New York Fed study? 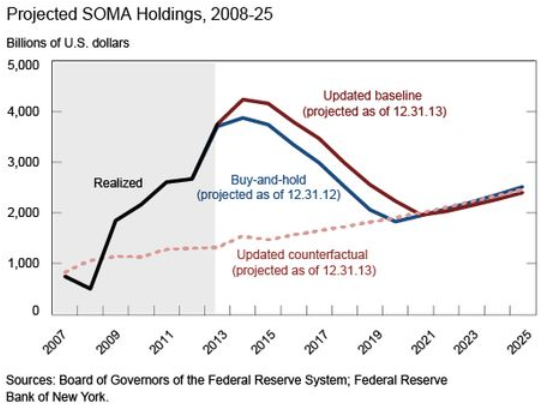 Technically, it shows that the Fed’s balance sheet is expected to shrink and return to the path it would have been on had there been no large scale asset purchases (LSAPs) over the past five years. This projection is a reflection of FOMC’s plan to eventually normalize the size of the Fed’s balance sheet. Bonds markets have understood this plan from the beginning as is evidenced in their inflation forecasts. The FOMC formally announced its plan to normalize and shrink its balance in its June, 2011 meeting. Subsequent speeches, press conferences, and congressional testimony by Ben Bernanke have reinforced this understanding. The point is the Fed never intended the LSAPs to be permanent. So again I ask, what do you see in the above figure? What is the bigger message it is telling? In my view, the answer to these questions is unambiguously clear. It signals the Fed never intended to unload both barrels of the gun and fully offset the collapse in aggregate demand. In other words, the figure reveals why Fed policy failed to end the slump. [O]pen market operations (OMOs) and helicopter drops will only spur aggregate demand growth if they are expected to be permanent. This idea is not original to Market Monetarists and has been made by others including Paul Krugman, Michael Woodford, and Alan Auerback and Maurice Obstfeld. Market Monetarists have been advocating a NGDP level target (NGDPLT) over the past five years for this very reason. It implies a commitment to permanently increase the monetary base, if needed. The key to the above story is that some portion of the monetary base expansion is expected to be permanent. If the public believes the Fed’s asset purchases are not going to be permanent and therefore the price level and nominal income will not be permanently higher, the rebalancing will not take place. I bring this up because this same point applies to helicopter drops or any other kind of fiscal policy stimulus. Now to be clear, all that is needed is a commitment to permanently expand the monetary base if needed. But such a commitment, if credible, would most likely raise the velocity of the monetary base. In this case, the needed permanent monetary injection would be smaller. In other words, the figure above attests to the failure of the Fed policy not only because it shows a temporary increase in the monetary base, but also because it shows such a large increase in the monetary base. Had the Fed credibly committed from the start there never would have been the need for all the subsequent LSAPs. The Reserve Bank of Australia did just this and its economy was one of the few not hit by the prolonged economic slump. [T]he Bernanke Fed never tried Abenomics. That is, for all the Fed has done over the past five years it never tried to do the kind of monetary regime change now being done by the Bank of Japan. A year ago, Japanese monetary authorities shook things up by credibly committing to permanently raising the nominal size of the Japanese economy. The evidence so far shows this program to be a smashing success. From the start, the Bernanke Fed took the opposite approach. It credibly committed to a temporary expansion of its balance sheet. The U.S. monetary injections, therefore, were never intended to be permanent and this makes all difference in the efficacy of monetary policy. So for all the praise the Bernanke Fed gets for preventing the second Great Depression, it should be equally noted that it allowed the long slump. By failing to do Abenomics for the U.S. economy, the Bernanke Fed effectively kept monetary policy tight for the past five years. There is no other way to say it. Okay, maybe there is another way to say it. The Bernanke Fed failed to meaningfully address the endogenous fall in the money supply and the decrease in money velocity. The Bernanke Fed could have done an American version of Abenomics, like nominal GDP level targeting, that would have arrested these developments. Instead, it did not and passively allowed total dollar spending to remain depressed. This failure to act is no different than an explicit tightening of monetary policy in terms of damage done to the economy. The only difference is that the public is more aware of the explicit form. So again I ask, what do you see in the above figure? P.S. Yes, the Fed’s ad-hoc decision making contributed to this failure. 2 Responses to "Does This Figure Show Why Fed Policy Failed?" Of course Fed policy was temporary. Its only raison d'être was to expand the banking bailouts and increase the capital base as an attempt to survive the next collapse. Had the Fed been concerned about money circulation in the middle, the net result would have increased demand. Why has everyone forgotten what we learned in the Great Depression, that in a liquidity trap monetary policy cannot bring aggregate demand back up to potential? Cease this charade. The reason the Fed's balance sheet is bloating is that they had to take trillions of dollars of bad debt off the banks' balance sheets. Heaven forbid any bank should write down a bad debt! The distribution is broken. The Fed is broken. The Congress is broken. The President is broken. The spirit of America is broken. May it come together and rise again!